In Germany Torbay AC’s Debbie Drake ran a Half Marathon “leg” of the Frieden geht “Peace is on” relay against the export of arms. 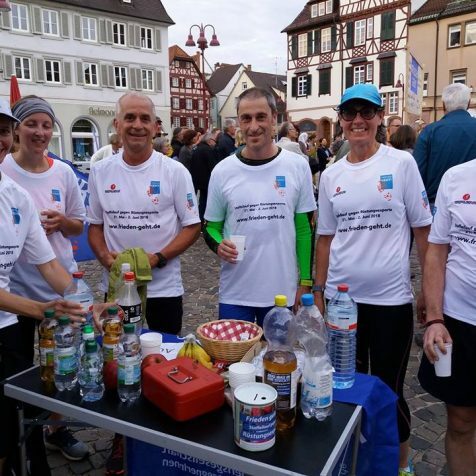 This will cover 250miles from Obendorf in the south to finish in Berlin on 2nd June, Debbie Drake, who was part of a team of six running the last stage of day 2 a half marathon finishing at Lahr in (1:58:00), saying a brilliant evening with a wonderful atmosphere. Betsy Bebbington finished 6th overall in (4:06:01) when she ran an event with illustrious connections “The Women Can Marathon” The challenging trail route from Tipton St John, on footpaths and the South West coast path, had an ascent of 2,500 feet with steep climbs and very technical descents. This was the first UK partner event for a global running movement known as 261 Fearless, whose figurehead is the class-act athlete Kathrine Switzer who made history in 1967 when, as an amateur athlete, she registered for the world’s oldest road marathon in Boston, USA – under the name K Switzer. It was, like all long road races, an all-male field, as at the time women weren’t permitted to race over distances farther than 1,500 metres She pinned her number – 261 – on her finished the race in 4hr 20min, and kicked off a women’s running revolution.